There is free audio materials from the L'Abri Ideas Library related to this title. Search for Joshua and the Flow of Biblical History on WorldCat! Discuss Joshua and the Flow of Biblical History on Facebook! 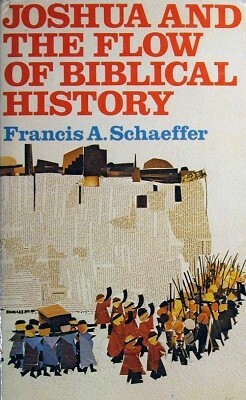 Schaeffer held Joshua to be a significant work both personally in discerning God's leading in life but also saw the book as an important historical book connecting the Pentateuch and the rest of the Bible. This is his treatment on this very important book in scripture. The book of Joshua brings to life real history during the crucial period of transition for the Israelites as they follow God\'s direction and settle into the Promised Land. Israel needed discipline in light of their newfound freedom. They faced the responsibility of living as a covenant people while adapting to change. Joshua describes the historic shift from the revelation of God\'s promises to their realization. God\'s care of his people become obvious, and their struggle with disobedience, selfishness, and fear is very human. Schaeffer\'s thoughts on the book of Joshua will show readers the historic, spiritual and intellectual nourishment available for the Christian life through the examples of Joshua and his fellow Israelites. In the book of Joshua, Schaeffer finds that God reveals his sorrow over human sin, as well as his gracious love for his people. This is as true for us as it was for those in Joshua\'s time. This study of the settling of Israel will inspire readers to see the hand of God present in all of history, including today. Recognized internationally for his work in the interface of Christianity and culture, Francis A. Schaeffer authored more than 20 books, which have been translated into scores of languages and have sold millions worldwide. He and his wife, Edith, founded L\'Abri Fellowship. Schaeffer passed away in 1984, but his influence continues worldwide.